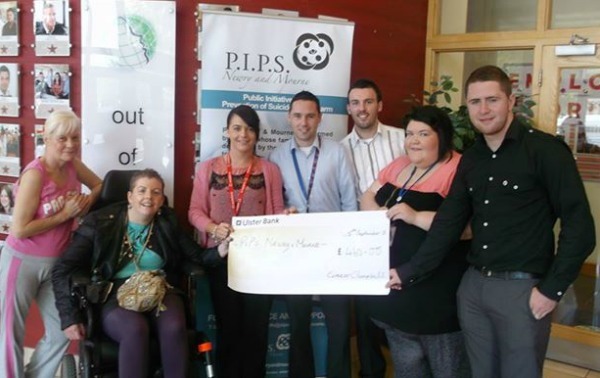 Eimear Campbell a Manager at Teleperformance along with her colleagues present Judith Murphy and Marie O Hagan with a cheque for £460 raised from Eimears second event for PIPS Newry & Mourne. Eimear organised a ‘Take Me Out Night' in Bellinis in August. Eimear would like to thank everyone who supported her including family and friends and to everyone who turned up on the night to make it such a success. Eimear would like to give a special thanks to the VodaFun Committee, Teleperformance, Darren Matthews for hosting, Mark Shevlin for DJing and Gavin and the Bellinis crew for organising the night and their support in selling tickets and taking part. PIPS Newry & Mourne would like to express sincere thanks to Eimear and her colleagues for their continued support and congratulate them and e veryone involved on such a successful event.